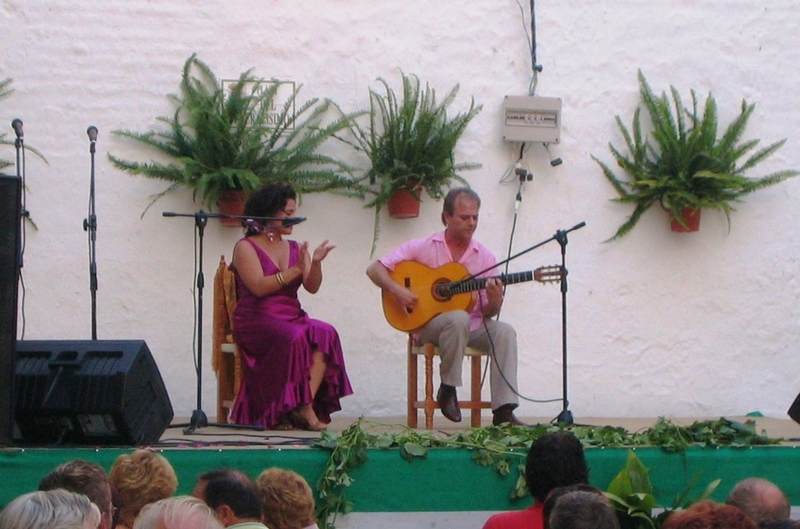 This part of Spain has a long tradition of flamenco. Proud beauties in swirling primary-coloured dresses clicking their castanets and stomping their heels to the haunting sound of a wailing melody accompanied by the distinctive strumming of wonderful Spanish guitars. Then there are the Andalucian horses, visually stunning and famed for their grace and dexterity; their riders echoing the same proud bearing of the flamenco dancers and singers. Occasionally we can see glimpses of these beautiful horses grazing outside, or peeping out from their stabling. Once a week or so we will all be treated to the wonderful sight of one of these animals, usually dressed in its finery parading through the ancient streets. Straight-backed rider reigning back a fiery animal who snorts as he high-steps, almost glides, along the road. Do they naturally lift up their front legs like that, or have they been trained to do so? Perhaps the classic stepping movements from Lippizaner or Andalucian stallions formed the basis for what we know now as dressage events. There hasn’t been many sightings of stray horses this year, although there is plenty of evidence that they are still around by the copious quantities of poo. I said ‘stray’ but I’m pretty sure they all belong to owners who just let them fend for themselves rather like ponies in the New Forest. We’ve seen a posse of about 9 including some foals who came right up to our fence, then disappeared. Not like the two persistent horses that just hung around for a few days and we heard tell that they were owned by Ricardo’s brother. 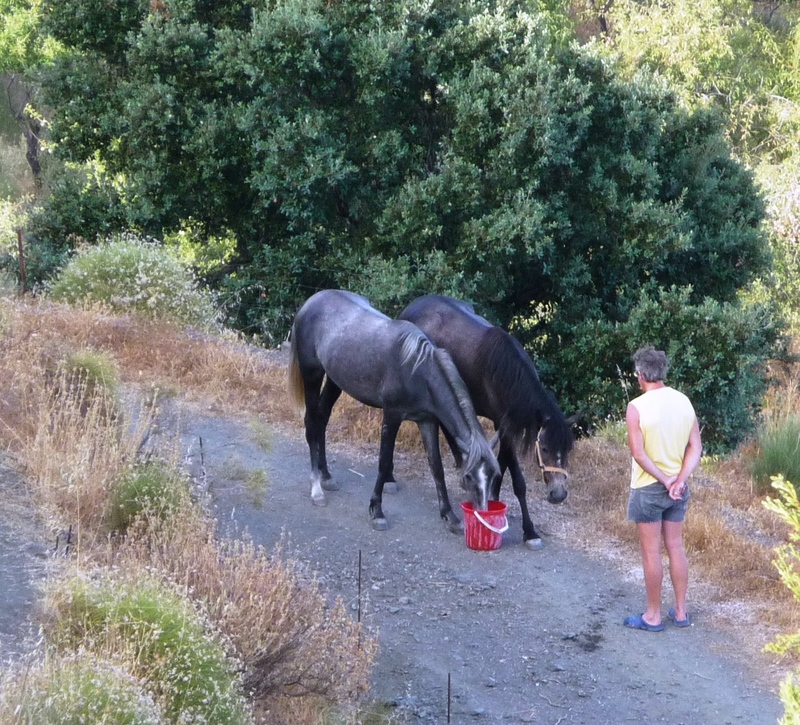 It was very hot and both we and the Belgians up the road brought out buckets of water which they greedily gulped down. Beautiful, noble creatures. 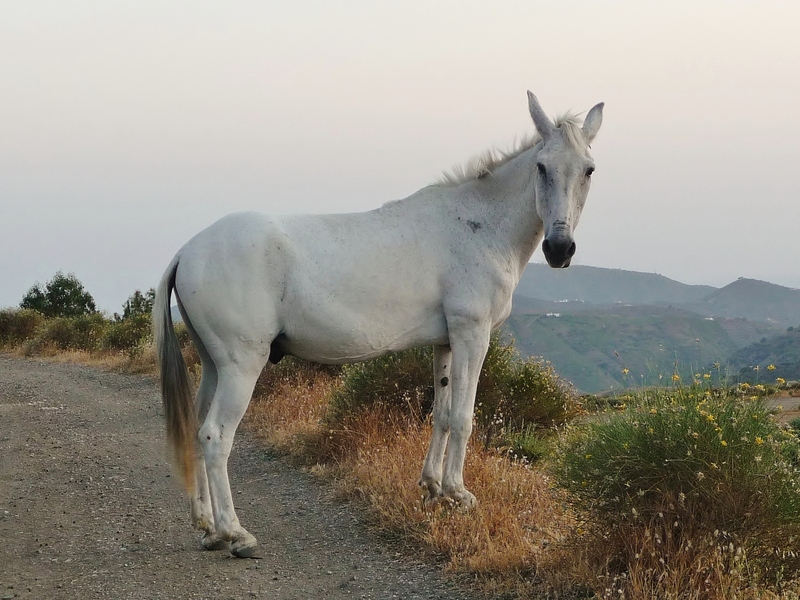 It quite took my breath away when we came back from our weekly water collecting trip, rounded the last bend before the cabin and came across this white stallion just surveying the view and idly flicking his tail. 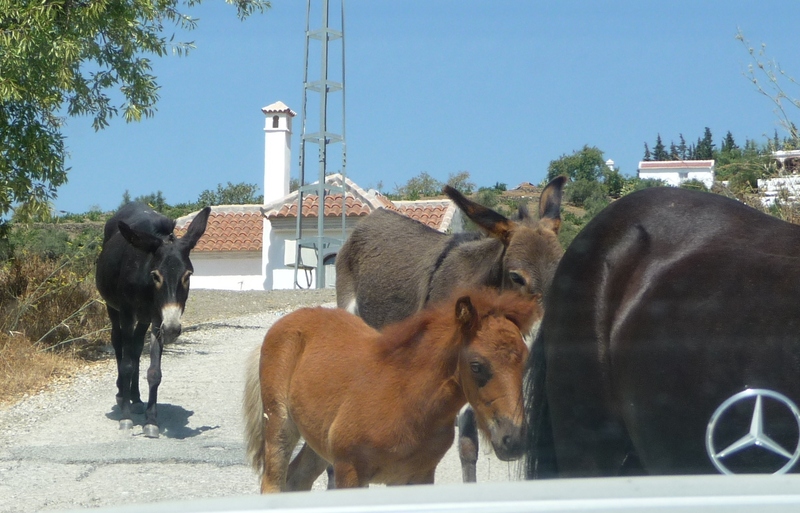 A few years back this angelic little group meandered slowly past the car but I haven’t seen loose donkeys around here before or since. 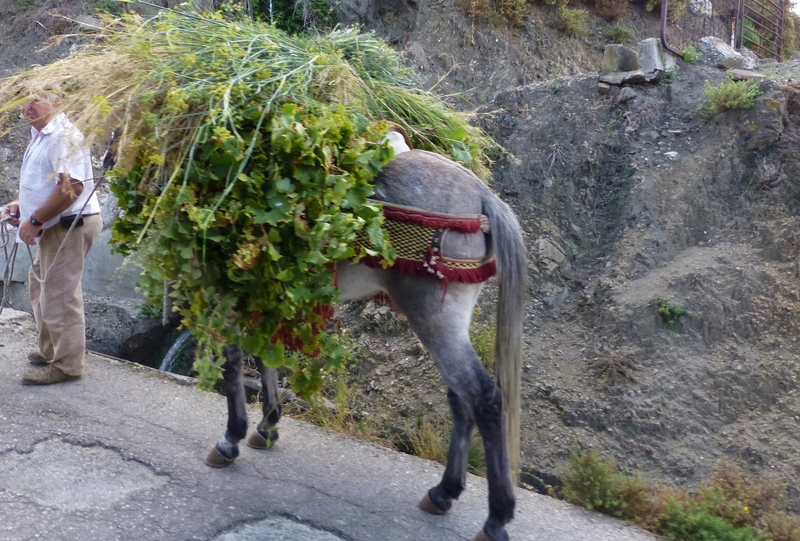 What we do see are mulas (mules) whose strength and stamina were used to optimum advantage during the first and second world wars. 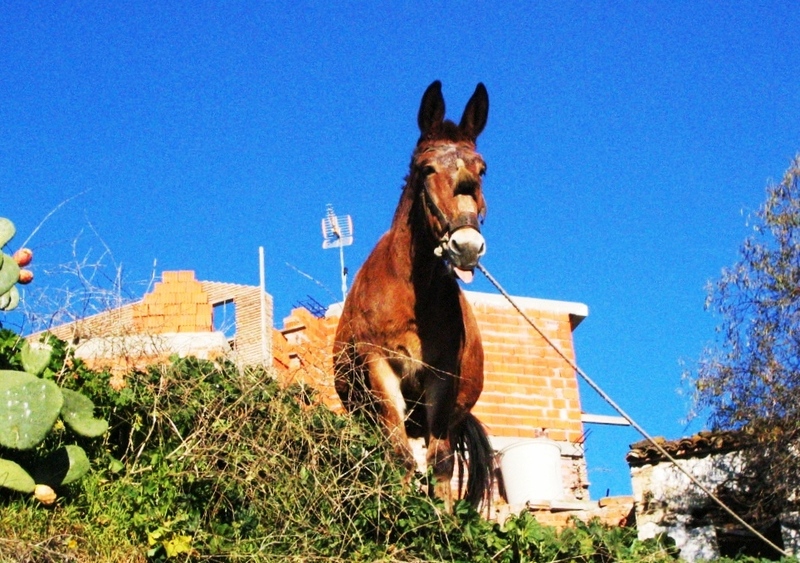 They are a common sight here, grazing as best they can wherever they find themselves tethered. The owner usually cadges a lift right on top of the panniered load, but will dismount when it comes to one of the many treacherous hills. 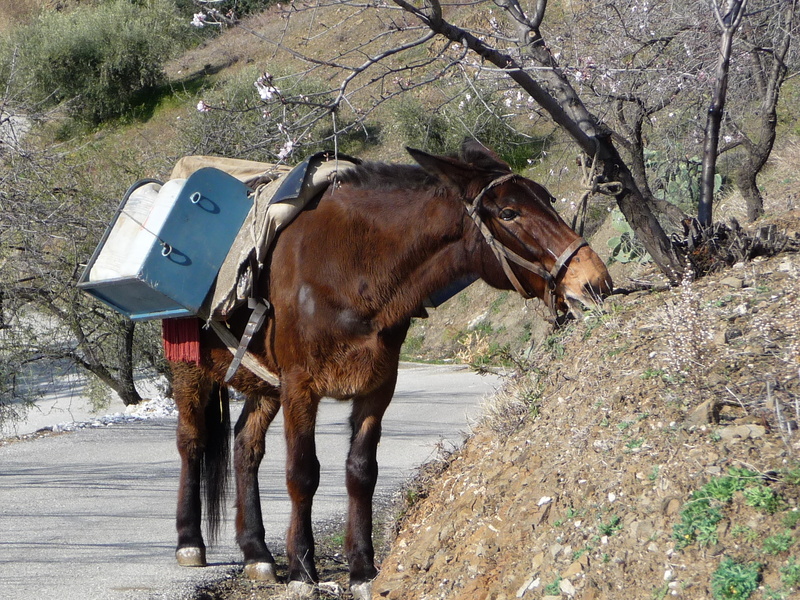 The mulas here are all put to their owner’s good use, and I often say that around these parts people still go to work on a mule! 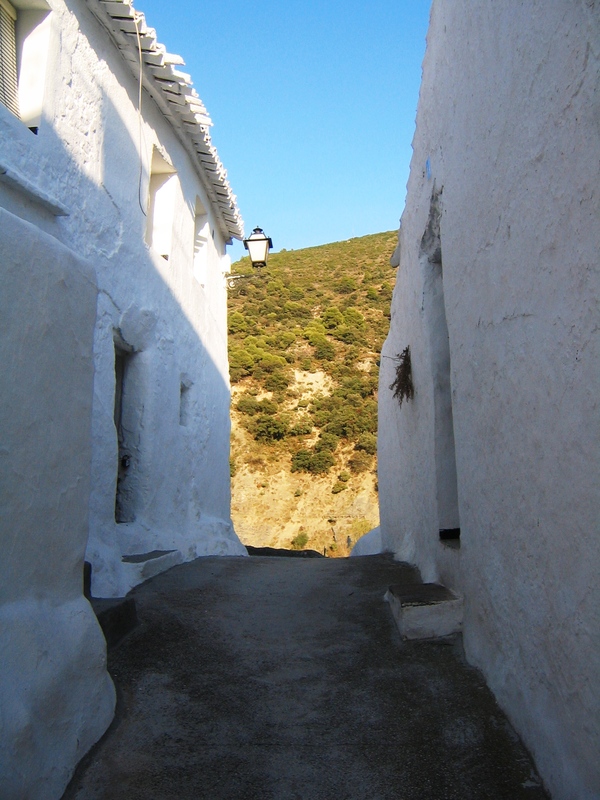 Our nearest little village has a typical Moorish layout of narrow steep streets and courtyard houses, and you can still see, smell and hear the family mule in its own quarters on the ground floor. 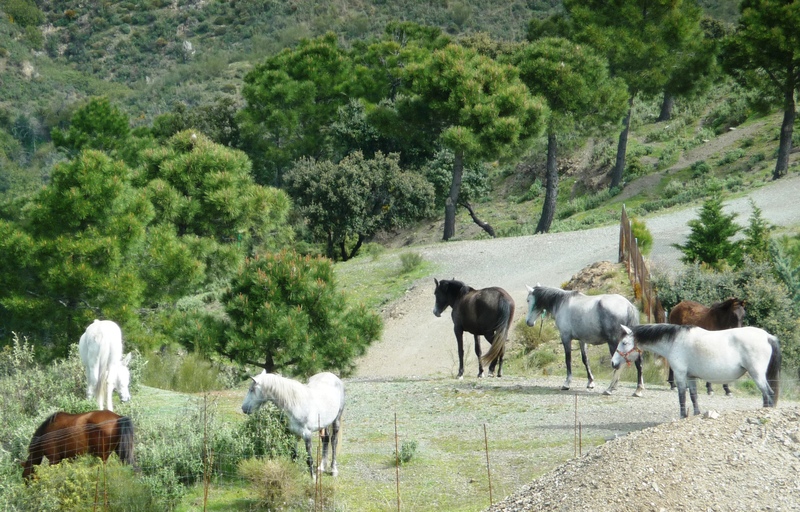 There are at least two rather anachronistic working farms with run-down stabling that have been nearly swallowed up by ‘progress’ in and around Torre del Mar. Both farms use oxen for draught work, and it’s a pretty special sight, especially when you see them ploughing patches of land. 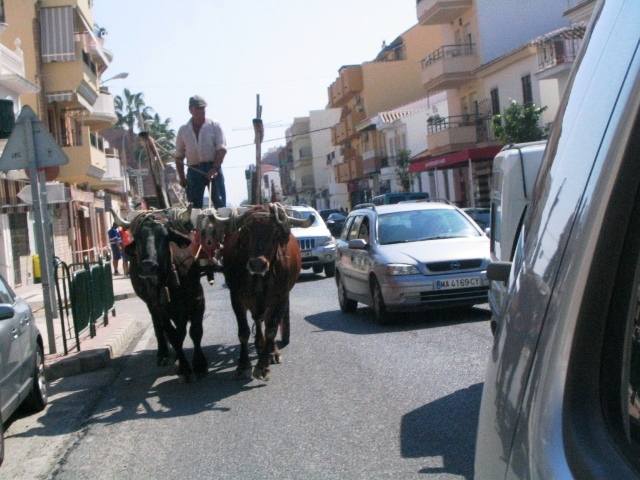 However, to go from A to B they have to be driven through the busy shopping areas and congested streets – much to the annoyance of beeping motorists that cannot pass. 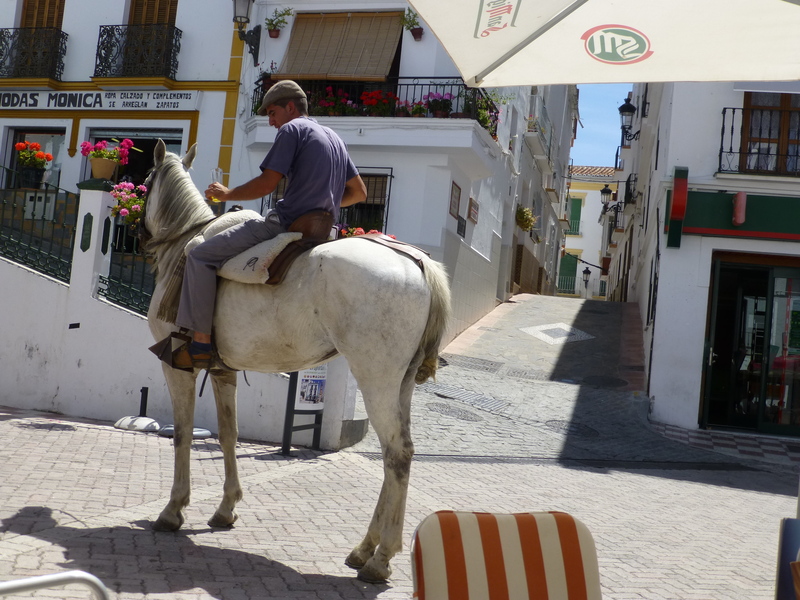 Yes, Andalucia’s certainly a curious blend of the old and the new and they don’t always make for easy bedfellows.